Our club is the second largest in South Africa and was re-formed in 1949 after WW2. The club started flying off a farm near the Bottleraary road for a while, then from the farm Phessantekraal before moving to Fisantekraal airfield. This was the club’s base for around 30 years before we moved to Worcester airfield (FAWC) in 1988. Only 1 hour drive from Cape Town gliding from our club offers an opportunity to experience the beauty of the world renowned Western Cape mountain ranges from the air. Cross country flights of 300 – 500km distance are common, but an ever increasing number of 1000km and longer flights have been achieved. The soaring conditions are excellent and include a combination of ridge lift, thermal lift, wave and convergence flying. We have more than 100 members and operate on a non-profit basis over weekends and on public holidays. Our club fleet consists of two ASK13 basic training two-seater gliders (ZS-GHV & ZS-GHB). We also operate two advanced training two-seat gliders, a Twin Astir (retractable) (ZS-GOK) and a Janus B (ZS-GVK). In addition the club has single-seat Jeans Astir (ZS-GUC) and an Astir CS 77 (ZS-GYX) that are available for solo pilots In addition more than 35 privately owned high performance gliders and self-launching gliders are based on the airfield. Our tug fleet has a Sling 2 as the main tug (ZU-ZFG) with our Rotax Falke SF25C (ZS-GZF), which is also used for training, as our back-up tug. Our club uses both aerotow and winch launch methods. We have a dedicated team of qualified tug pilots and instructors who offer their time free of charge to provide affordable tuition for beginners and advanced students alike. Club facilities include a clubhouse with bar and braai facilities, swimming pool, club hut (6 bed bunkhouse) and a separate kitchen area as well as separate ablution facilities. Three runways are used for our operation:- a 1600m long main (15/33) with 500m paved sections at either end with a parallel gravel winch runaway and a 700m long gravel cross runway (12/30). Summer gliding begins at about 10h00 and ends at sundown, after which we gather in the clubhouse for drinks and lively discussion on the day’s flights. For more technical information on ridge flying from Worcester you can also read Alan O’Regan’s Ridge Running Guide from Worcester (with accompanying maps). Thermal conditions occur throughout the year, but are best on post-frontal days. Convergence can occur during weather pattern changes and is generally formed in lines through the valley. Pure Worcester Magic: A flight by Martin Grunert and published in South Africa Soaring Magazine. Winds are generally from South East (a shallow, low-level wind) or North West (a wind which extends to great height), both produce ridge lift. Northerly winds also produce lee-wave conditions. 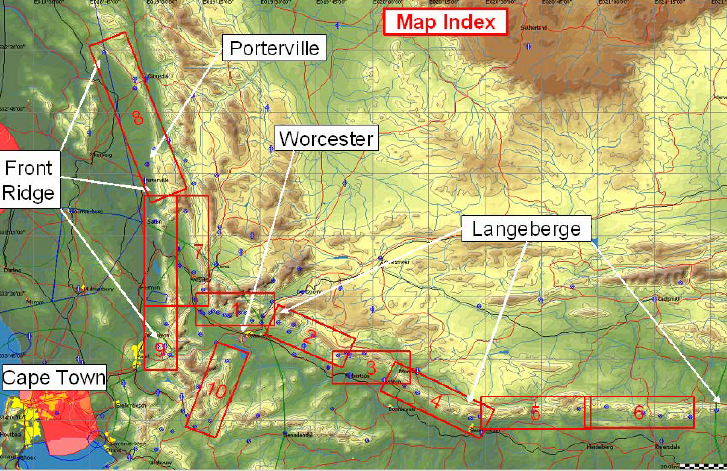 Ridges around Worcester are oriented in an “L” with the upright running South to North (Atlantic Ocean Side) and the cross piece running West to East (Indian Ocean side) with Worcester almost exactly at the corner. Long ridge flights are possible in winds that are NW (good for wave in the lee of the “front” ridge), SW (our best conditions) through SE. Winds are strongly influenced by Indian Ocean and Atlantic Ocean weather patterns. Since 1989 we have successfully presented more than 50 ab-initio training courses. Flight training during our ab-initio courses concentrates on true beginners, however, more experienced pilots are also welcome. For more information on the next available training course please contact us.